Can season 2 of ‘Smash’ be a smash? True story: A few weeks ago I sat down to watch the advanced screener of Smash. I watched an ENTIRE episode before I realized I had watched the second episode of the season and not the two-hour season premiere, which airs tomorrow night at 9 p.m. on NBC. Sure I was mildly concerned that suddenly the show featured new characters who weren’t introduced. And yes I did find it a tad annoying that so many story lines were dropped sans any explanation. But at no point did it occur to me that I was watching the episodes out of order. I only realized it when I went to watch episode two and realized I already had. It shows just what a mess the show was by the end of last season. I thought the looniness that defined Smash‘s freshman season was simply continuing. I loved the Smash series premiere last year. I had such high hopes for the series. I watched every single episode of its freshman season. I wasn’t hate watching. I was watching with the hopes that someday the show would become the series I thought it would be in the pilot. And I would see sparks of potential – musical numbers that moved me. Relationships that drew me in (I loved Christian Borle’s Tom and Leslie Odom Jr.’s Sam). Anjelica Huston’s Eileen Rand in every, single scene. And the problem wasn’t Ellis. Or Leo. Or Dev. Or Julia’s adoption. It was the way those storylines were executed. Ellis could have been a great character if he had been better written and better performed. Think of Nolan on Revenge. He’s an equally ridiculous character but he’s much better written and infinitely better performed and we love him. There were two near fatal errors. Julia (Debra Messing) had an affair almost immediately. It’s hard to root for a protagonist who is not only cheating but cheating on the couch in the rehearsal room where there are a million open windows. I had no sympathy for her plight and that’s not a good thing. The second was that Ivy (Megan Hilty) didn’t just change episode to episode. She changed scene to scene, sometimes sentence to sentence. Was she a vixen? Nice? Were we supposed to feel sorry for her? Hate her? Like her? Root for her? Was she strong? Weak? By the end of last season when Ivy was overdosing, I said out loud to the TV, “Oh come on!” The disaster of a character I had come to know the first season wouldn’t even do that. So Smash begins its second season hitting the reset button and hoping that viewers don’t have much of a long term memory. Dev is gone. Ellis is gone. Julia’s family is gone (although poor Frank does get a send-off) and so is Michael. That frees Julia up to date which is probably where the show should have had her in the first place (enter Rescue Me’s Daniel Sunjata). Storylines are completely dropped –usually with a mere throwaway line. Julia’s possible pregnancy? Gone. Ivy’s suicide attempt? Explained away. Julia’s scarves? Gone, but strangely her clothes are still shapeless. New characters abound. 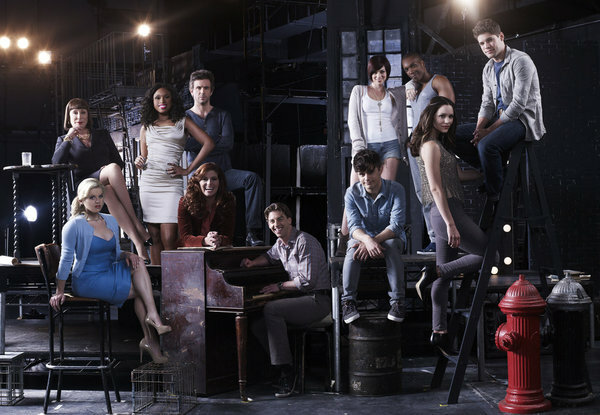 Jennifer Hudson joins the cast as Ronnie Moore, a Broadway star looking to change her good-girl image and Derek (Derek (Jack Davenport) is just the man to do it. Broadway stars Jeremy Jordan (Newsies) and Andy Mientus come aboard as singer/songwriters Jimmy Collins and Kyle Bishop who befriend Karen (Katharine McPhee). Hudson is predictably fantastic. She was my favorite years ago on American Idol and I always love to hear her sing. But her character is clichéd. Jordan’s Jimmy is a little too petulant and so far Mientus’ Kyle doesn’t really leave an impression. And we are still hearing about what an amazing talent Karen is and how she has that indescribable star quality. The only problem is it still seems that Ivy is the one bursting with talent. Anytime a show hits the reset button, it’s starting from a disadvantage. New showrunner Joshua Safran is trying to fix the problems he inherited. It’s too soon to tell if he’ll succeed. Did you watch Smash last season? Are you going to watch this season? Talk about it below. This entry was posted in Smash, Uncategorized by TV Gal. Bookmark the permalink. i kind of think the ratings are going to kill them and it’s too bad, there are the seeds of a great show here. am i the only one who thinks ellis is jerry’s new assistant? Season 2 is a train wreck so far — too many disparate story lines, completely improbably and unlikeable characters (Jimmy is too hateful even to love hating), dialogue that makes me cringe. Apparently season 1 was also a disaster, but at least it kept its focus on Bombshell. I get the feeling the new writers have no idea where they want this show to go, and the confusion is apparent in every episode so far.